In 1992, the Virginia Museum of Fine Arts opened an exhibition of architectural drawings titled The Making of Virginia Architecture. The exhibition displayed 118 drawings by Virginia architects as well as non-Virginians such as Thomas U. Walter and Frank Lloyd Wright, who had designed Virginia buildings. Serving as curators were Charles Brownell, William Rasmussen, Richard Guy Wilson, and myself. For this Classicist Blog essay I am sharing a dozen selected drawings from the exhibition spanning some 200 years and displaying a range of drawing techniques from simple sketches to elaborate watercolor presentation drawings. While we exhibited five drawings by Thomas Jefferson, I have not included any Jefferson drawings here since they are well known and have been published numerous times. One of the exhibition’s special treasures, shown below, was George Washington’s own drawing for the expansion of Mount Vernon. The ICAA strives to keep alive the tradition of architectural drawing. In the age of CAD and computer imaging, hand drawing and rendering risk becoming a lost art. It is hoped that the various images shown below will inspire an appreciation of the role hand drawing has played in the creation of noteworthy works of architecture. George Washington’s simple drawing of Mount Vernon’s west elevation is testament to the fact that, like Jefferson, the farmer, soldier, statesman, and first U.S. President, was also an amateur architect. 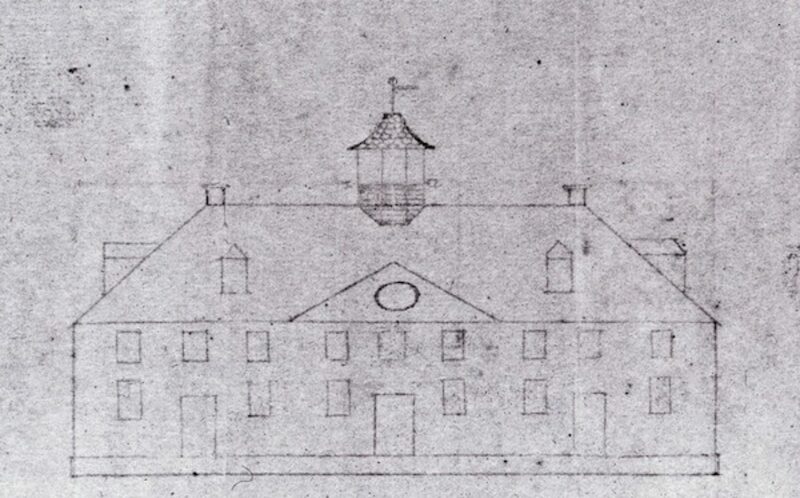 The drawing illustrates how the house was to be configured following Washington’s extensive alterations and additions made between 1774 and 1787. The expansion included additions on either end with their own separate entrances, all covered by a broad hipped roof crowned by an octagonal cupola. The elevation reveals that Washington intended a symmetrical arrangement of the bays, but the irregularity of the original dwelling’s openings prevented him from achieving it. Regrettably, we have no drawing by Washington of the opposite side with its celebrated ‘piazza,’ Washington’s unique innovation. John Baylor, a member of Virginia’s plantation aristocracy, planned a replacement of his family house with what would have been one of the grandest mansions ever erected in the state. 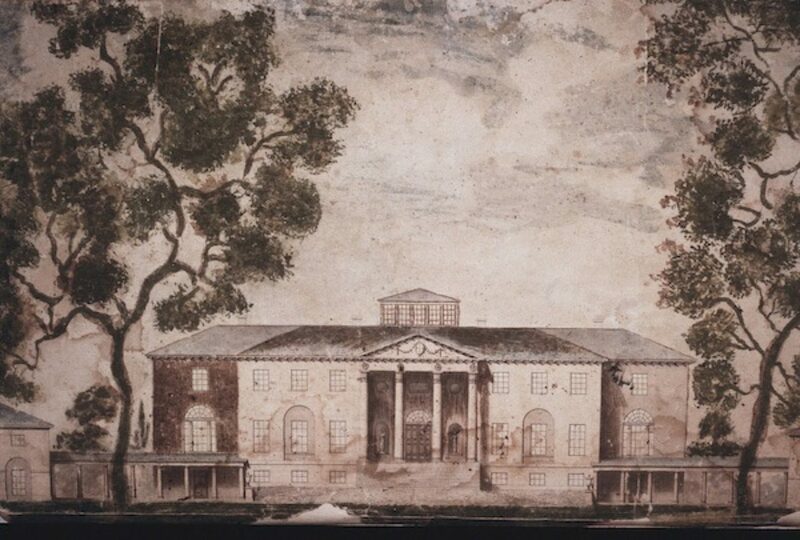 Baylor apparently acquired a taste for monumental architecture while being educated in England and likely acquired this drawing from an architect while there. Although not a particularly polished scheme or delineation by English standards, it nonetheless would have outshone most anything built in America at that time. The drawing reflects the refined neoclassicism of Robert Adam, even incorporating niches with classical statues on either side of the front door and colonnades connecting to dependencies. Baylor affixed this drawing to his copy of The Architecture of M. Vitruvius Polio (London, 1771) where it now remains. Construction of the house never progressed beyond some foundation work. Someone at a later date attempted to ‘enhance’ the drawing by adding the garish trees. Richmond’s catastrophic theater fire of 1811, in which seventy-two leading citizens including the governor perished, led the city to plan a permanent monument with an attached church for the disaster site. Benjamin Henry Latrobe, who had already provided numerous designs for the city, produced this finely delineated proposal, a composition unlike anything seen before in America. It called for a domed neoclassical church fronted by the monument over a crypt containing the remains of those who died in the fire. The monument itself consisted of a low-profile Egyptian-style structure with battered sides and topped by a stepped pyramid. The scheme proved too costly, and despite Latrobe’s efforts to simplify, it was passed over in favor of an equally avant garde design by Robert Mills, Latrobe’s pupil. 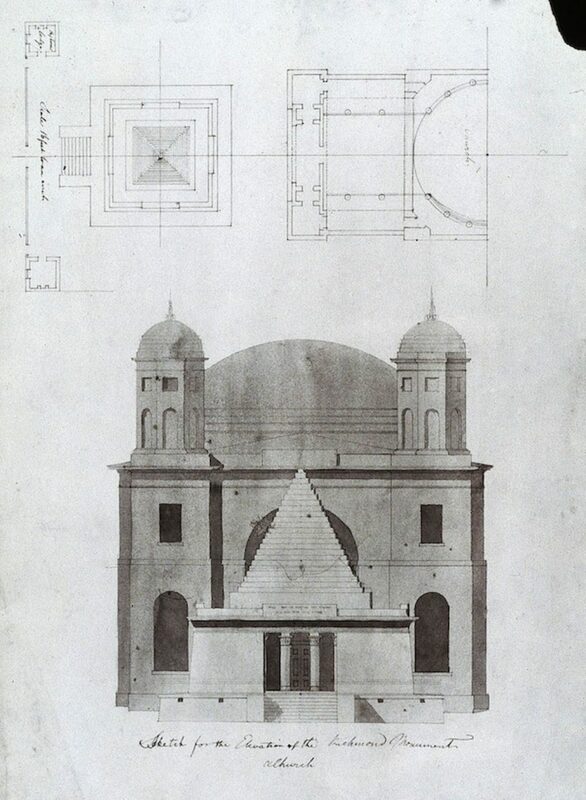 Mills’s submission, known today as Monumental Church, was built absent a proposed rear tower and is regarded as one of the country’s premier early architectural landmarks. Special Collections, University of Virginia, Charlottesville. Thomas Jefferson assembled numerous skilled builders for the construction of both Monticello and the University of Virginia. One of them, John Neilson, a native of Northern Ireland, proved to be an accomplished architect as well as draftsman. Neilson executed for Jefferson a number of watercolor drawings of university buildings. These drawings were long attributed to Jefferson’s granddaughter, Cornelia Randolph, but research by Richard Cote has firmly assigned them to John Neilson. In 1816, Jefferson’s friend, Gen. John Hartwell Cocke, engaged Neilson to assist with the design of his new plantation mansion, Bremo. 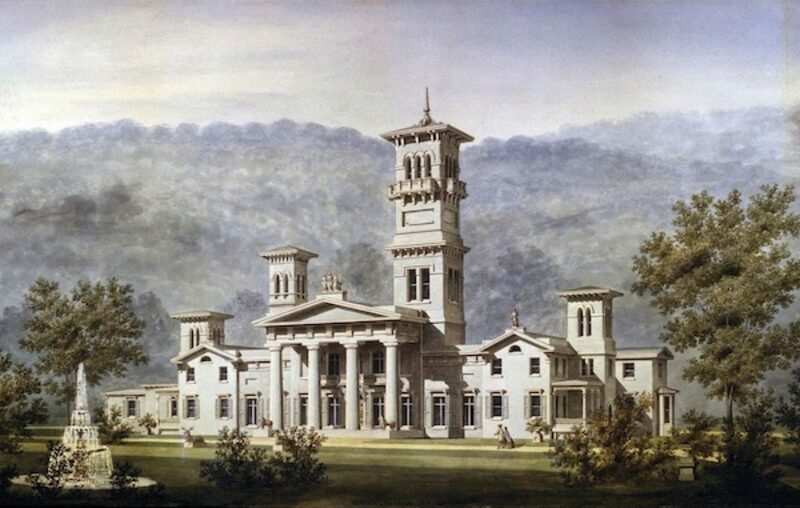 As shown in Neilson’s elevation (now also properly attributed), the design is a cohesive essay in Jeffersonian Palladianism, a distinctly American architectural idiom learned by Neilson through his involvement with Jefferson’s projects. The house was originally built with a flat roof and parapets, but constant leaking forced Cocke to cover it over with the present hipped roof in 1836. Pencil, pen and India ink with watercolor on paper; 15 X 20¼ inches. Signed and dated: Robt. Mills/Archt. Pub. Bldgs/City. Washington July 17, 1838. Robert Mills arrived in Washington from his native Charleston in 1800 as a nineteen-year old to assist James Hoban with the completion of the White House, for which Hoban was the supervising architect. Several months later, Mills came under the tutelage of Thomas Jefferson and enjoyed access to the numerous architectural books that Jefferson brought to Washington and kept at the White House. 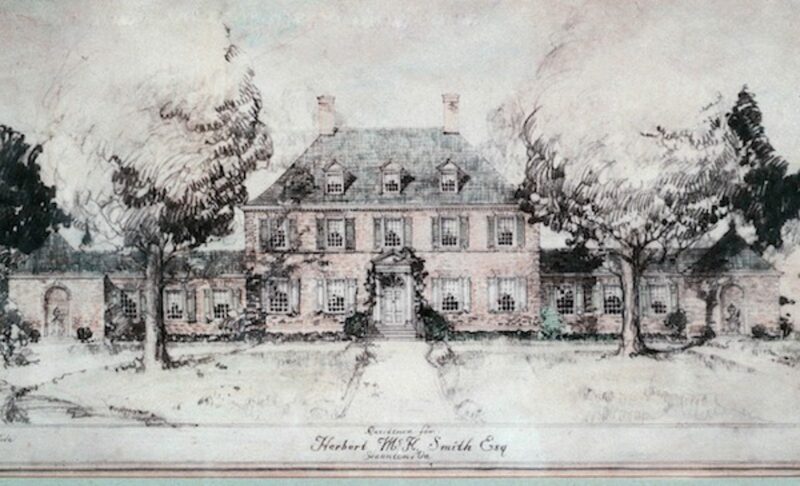 Mills produced ink and watercolor renderings for Jefferson, and refined his rendering skills when he joined Benjamin Henry Latrobe’s office in 1803. 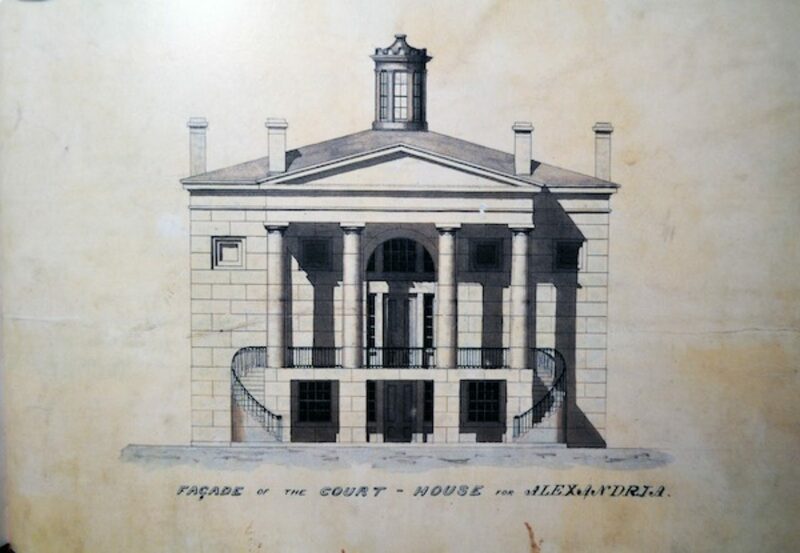 The influence of Latrobe’s lean classicism and rendering techniques can be seen in Mills’s luminous presentation drawing for the Alexandria courthouse. Mills would use the simplified Greek Doric order seen in the courthouse drawing in a number of his works. The courthouse was demolished in 1905. Inscribed lower left: LIND & MURDOCH ARCHs; lower center: MURDOCH & RICHARDS. DELs, 1861. This astonishing image was prepared to show the proposed remodeling of an existing country house. The house incorporated an 18th-century dwelling enlarged in the 1830s with the construction of the porticoed center section and flanking two-story wings. In 1859, its new owner, Thomas Swann, the former president of the B&O Railroad and governor of Maryland, hired Baltimore architect, Edmund G. Lind, to remodel the house in the newly popular Italianate manner. Lind complied by adding the bracketed window hoods and four tall Italian Villa-style towers, a treatment made fashionable by Queen Victoria’s Osborne House. The towers were built, but, alas, were removed in the 1890s by Swann’s daughter. Regrettably, no photograph has surfaced showing the house with its towers. 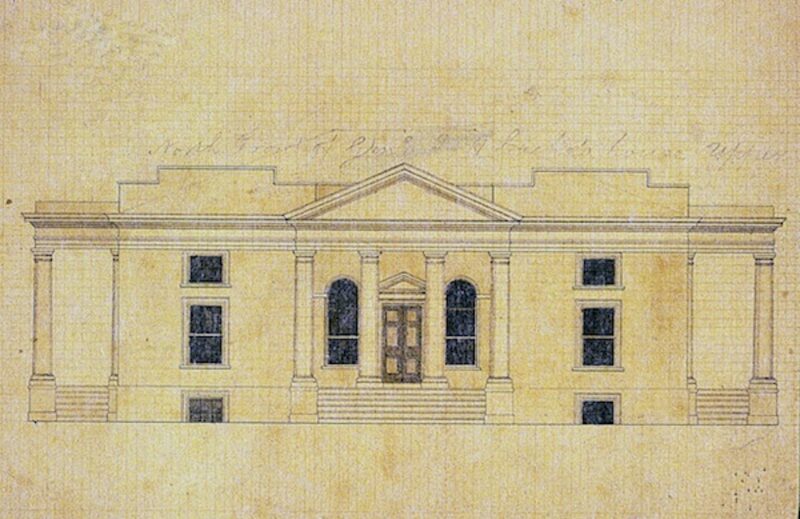 The rendering, executed by Lind’s associates, William T. Murdoch and William T. Richards, remains the sole record of this amazing composition and is a rare example of a polished presentation drawing of the antebellum period. This splendid Beaux-Art work is the result of a bequest to the city of Winchester by Judge John Handley of Scranton, PA, who made a fortune in coal investments and developed an affection for the small Shenandoah Valley community and its Scotch-Irish heritage. The handsomely rendered presentation drawing by E. Eldon Deane helped Barney’s firm secure the commission. The library was completed in 1913 largely as illustrated. Triangular in plan, the library is fronted by a heroic, triple-arch entrance that recalls both the New York Public Library and Palladio’s Loggia del Capitaniato. With its smartly dressed visitors and fine carriage, the drawing signals the impression that this grandiose work would fit comfortably in any European capital. It also is a demonstration of the exceptional quality of architectural rendering of the period. Mechanical print of charcoal drawing on paper with colored pencil added; 11 X 24 inches. The fashionable New York architect, William Lawrence Bottomley, developed a large following in Virginia, receiving some forty commissions in the commonwealth between 1915 and 1956 for new works or for alterations and additions. Bottomley specialized in interpretations of Virginia’s colonial architecture, declaring “this old southern ideal of country house architecture [is] one of the finest things we have and it is still vital.” Although on a hilltop site with splendid views of the Shenandoah Valley countryside and Blue Ridge Mountains, Waverley Hill took the form of a James River plantation house extended to a five-part composition. Ever the eclectic, Bottomley introduced a Maryland touch with the front doorway, based on the entrance of the Hammond-Harwood house in Annapolis. The rendering presents the house well settled in with mature landscaping. The house was built as shown. The architectural landmark of Richmond’s Byrd Park, the Carillion was dedicated in 1935 as a memorial to the Virginians who served in World War I. A competition for the design was held in 1925 with Paul Cret’s submission for a granite arcade judged the winning entry. Ground-breaking for the Cret scheme took place but construction was halted three months later in order to consider options for a carillon, which public sentiment determined to be a more suitable monument. 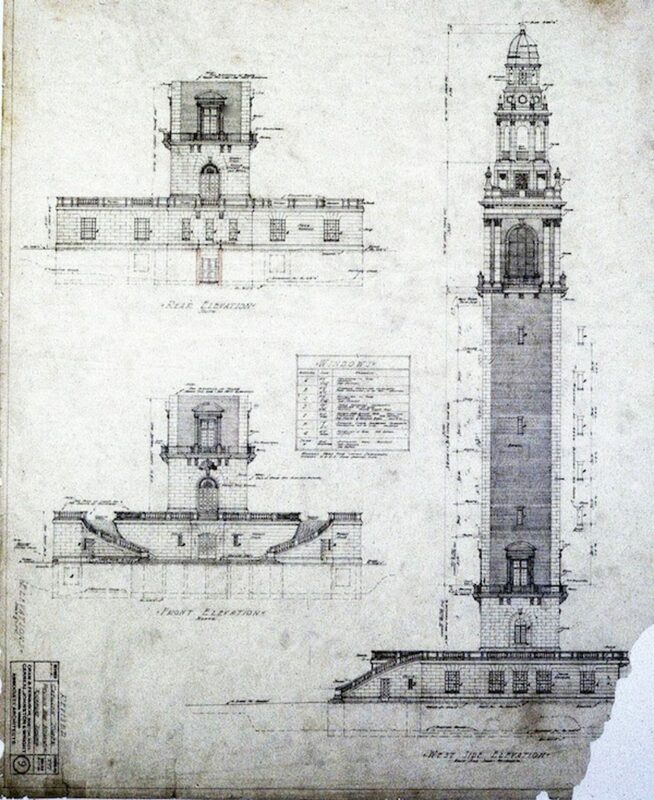 The resulting substitute design by Ralph Adams Cram called for a 200-foot-tall Georgian-style brick campanile with limestone detailing. As stated at the time, the style was chosen because “The Commonwealth of Virginia is the great southern exponent of that noble Colonial architecture.” Built as designed, the Carillion houses fifty-three bells cast by John Taylor & Co. of England. This drawing by the visionary artist, Hugh Ferris, captures the new-found drama of commercial air flight. The activity, noise, and wonder of a modern airport are all felt. Though trained as an architect, Hugh Ferris achieved fame as an architectural renderer. His bold futuristic depictions of skyscrapers influenced the designs of many of these works. National Airport (now Reagan National Airport) was established largely through the urging of President Franklin Roosevelt who recognized the need for the capital city to have adequate air service. The original concept for the terminal was for a streamlined appearance. Roosevelt, however, preferred a more traditional image, and suggested that the façades should reflect Mount Vernon, not far away. Hence, the terminal was decked out with a range of square piers on the west elevation and cylindrical columns on the runway side. 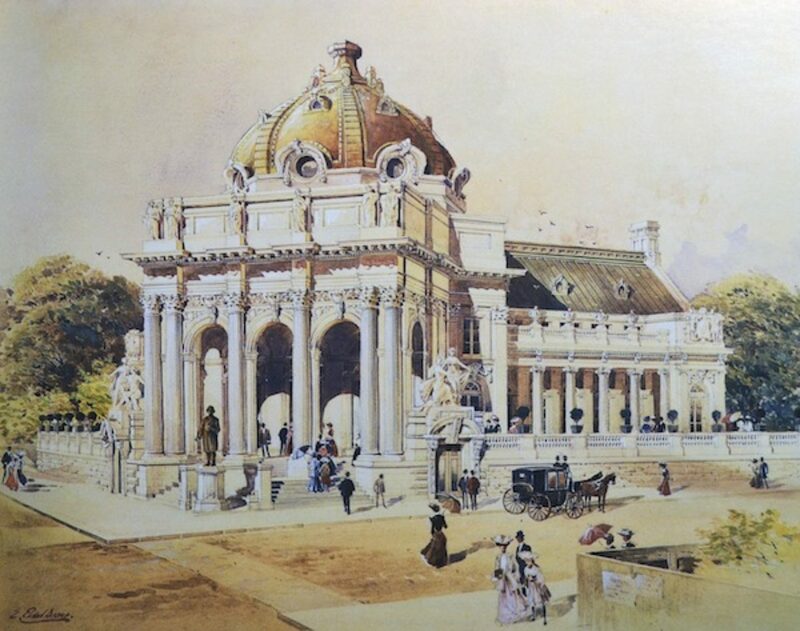 Ferris’s drawing was a preliminary study for a now lost finished rendering. Howard L Cheney served in the Office of the Supervising Architect in the Public Building Administration. The thrust and soaring qualities of modern jet flight are brilliantly captured in Saarinen’s nimbly dashed pencil sketch showing his preliminary concept for what would be the nation’s first all-jet airport. 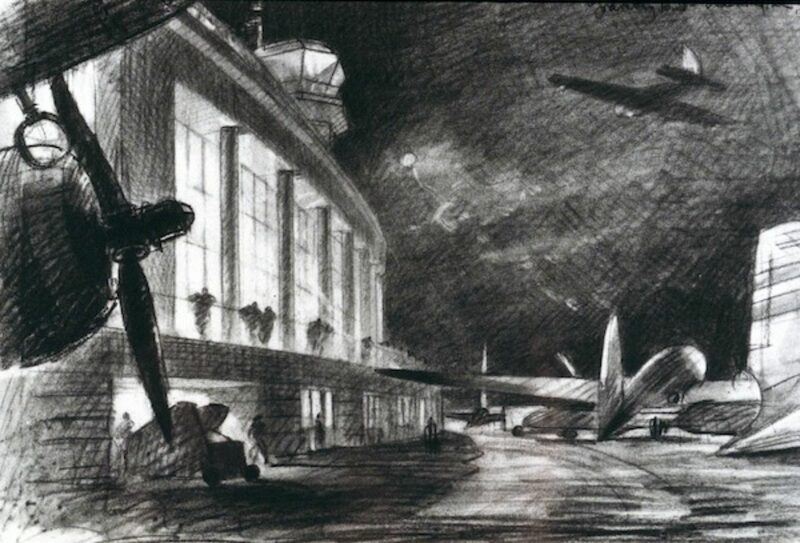 The sketch shows the forward leaning piers that would be incorporated into the final design, but not the suspended curved roof that defines the terminal today. Saarinen later described the finished roof, saying it “resembles a huge continuous hammock suspended between concrete trees.” With its progression of tall piers, Saarinen intended to make the terminal a monumental modernist entrance to the nation’s capital city. Moreover, the terminal was to be devoid of the ‘fingers,’ that snaked from the central check-in area, using instead the concept of the ‘mobile lounge’ that transported passengers directly from the terminal to their airplanes. 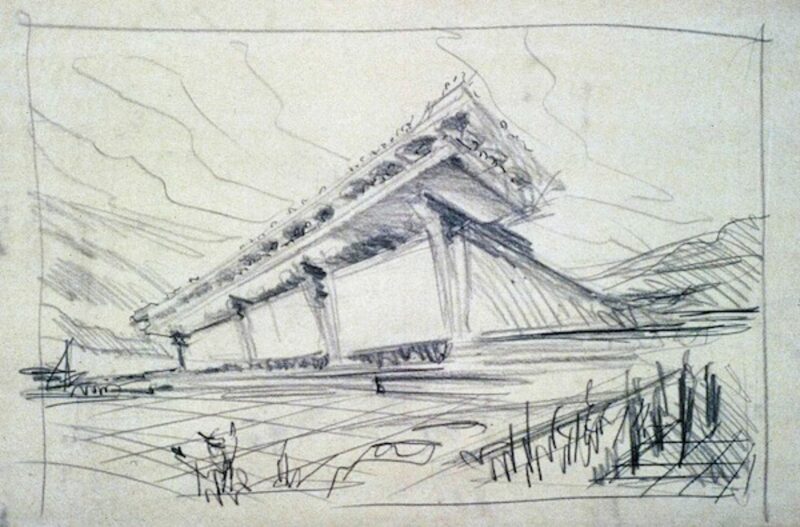 More than fifty years later, the Dulles terminal still projects the dynamism displayed in this early sketch. Robert A. M. Stern’s 1984 twin additions were made to a 1974 dining hall, a vacuous modernist structure spanned by large shed roof. The airy design was part of the university architecture school’s Dean Jaquelin Robertson’s effort to have new buildings reflect the university’s Jeffersonian heritage. Stern complied by breaking the composition into pavilion-like sections framed by paired Tuscan columns and incorporating Chinese lattice panels, all supported on a brick arcade. The different units were visually integrated by a Tuscan entablature. The composition shown in this drawing was applied to both the north and south elevations of the existing dining hall. 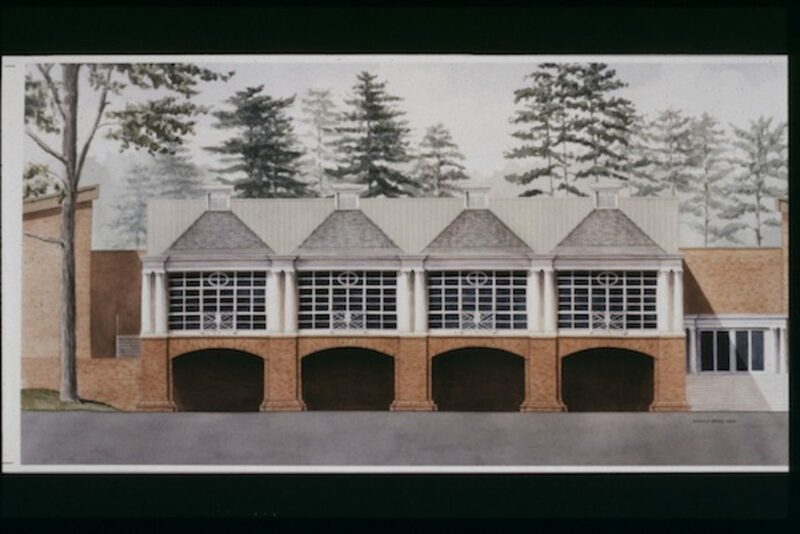 The watercolor rendering was produced by Stern draftsman Andrew Zega five years after the work was completed to record the project. Unfortunately, the need for a larger dining facility resulted in the demolition of the entire complex in 2004. Charles Richard Cote, The Architectural Workmen of Thomas Jefferson in Virginia. Doctoral dissertation (Boston University, 1986). Quoted in The Making of Virginia Architecture (Virginia Museum of Fine Arts, Richmond, Virginia, 1992) p. 370  Ibid., p. 380. Eero Saarinen quoted in “Dulles International Airport.” Architectural Record (July 1963).